In this Home Décor segment, Lisa Canning, Interior Designer shows us a great way that condo dwellers or small urban homes can maximize space. 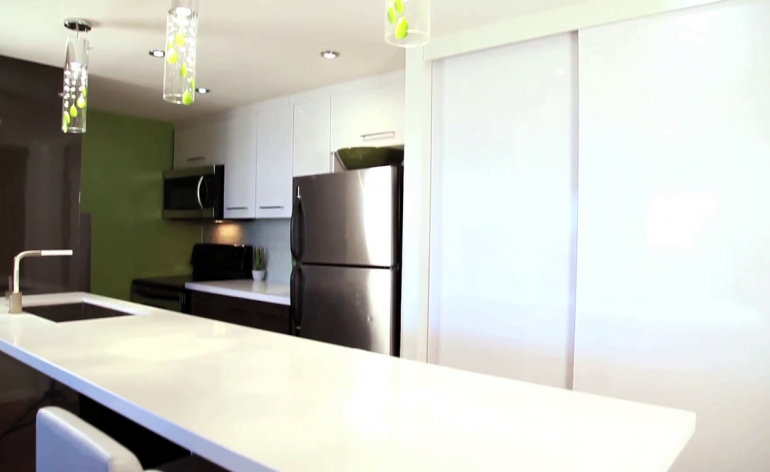 This particular Toronto based condo originally had separate dinning and kitchen areas. By elongating the kitchen counter it doubles as an island for comfortable counter space and an impressive, modern, eating area. Plush stools were added to allow this family to be able to relax at the table for long periods of time. The effect is a sleek and efficient way to maximize space in an urban residence. More tips from Lisa are available home category right here at lifestylevideos.com or visit lisacanning.ca. Lisa Canning is a Toronto-based interior stylist with a penchant for chic, contemporary, personalized interiors. A graduate of Ryerson University’s acclaimed School of Fashion, Lisa brought her flair for textiles and color as she transitioned into designing homes on HGTV’s Marriage Under Construction. Lisa launched her design practice shortly thereafter specializing in customized, modern interiors for both commercial and residential spaces. Currently, Lisa runs the design team on HGTV’s For Rent. When not working on client’s spaces, blogging or designing custom millwork, she can be found relaxing with her husband Josh and four children.